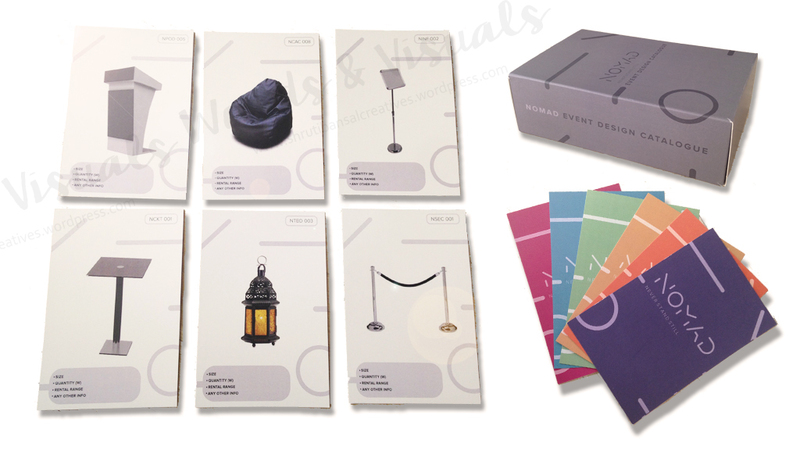 The idea was to create a catalogue of products and accessories used to design and populate an event or experience space. This catalogue had to be tangible, well designed, smart, functional, easy to use/handy and most importantly easy to upgrade. So the solution I came up with was taking the design inspiration from the ‘playing deck of cards’. The cards are tangible, small and easy to manage, can be stored efficiently, do not take much space, can be printed in many numbers and new cards can be added to the deck when required and finally, they are fun! I know for a fact that if I sit to brainstorm with my production team as to what kind of elements do we use in our event experience space then I would love to shuffle and throw around the cards to see what combinations go well together and make up for the event design. A good brain teaser for the brainstorming of ideas indeed! This is strictly an in-house deal, and like any other database management principal, the data on these cards is on an excel format which serves as the back-end support. The cards are color coded based on the categories the items belong to and each card is also coded with a number to help find them easily in the database or help find the actual item in the warehouse. Here is a sample of what was created..